William Shayer was a self-taught English artist of great versatility. He began his career in Southampton painting decorations on rush bottom chairs, then went to Guildford, where he became a carriage painter, after which he started doing heraldic painting. He was chosen to create the funerary badge of the fourth Duke of Richmond. In 1814 Shayer was commissioned to chalk a design on the floor of a ball being held to celebrate the overthrow of Napoleon. Meanwhile, he devoted his free time to landscape painting whilst making his living painting theatrical scenes, as a reproduction artist, and also as a painter of signs for inns and other establishments. He experienced a period of financial difficulty when his first wife, Sarah, died and he was left to support and care for five children. However, he did not remain a widower for long and with Elizabeth, his second wife, he produced five more children. With the opening of the Hampshire Painting Gallery, Shayer's situation improved; he sold thirty paintings in the first season. He settled in Southampton at Bladon Lodge in 1843, in an area renowned for the beauty of it's skies. As his fame grew Shayer resisted offers by his peers to go to London. He loved the landscape of southern England and produced many genre paintings of rural life in the manner of Francis Wheatley, Julius Caesar Ibbetson and predominantly, George Morland. His favoured themes which depicted harvesting, milking, dragging timber, scenes of village life and interiors of inns. Shayer would also paint genre scenes of guards, gipsies, hunts, Bohemians, shepherds and beach scenes crowded with fishermen and boats. The skill he had acquired in the lesser genres provided him with a thorough technical grounding. Shayer’s career was helped considerably by the patronage of a wealthy Southampton merchant, Michael Hoy. He sometimes collaborated with other artists. Particularly successful were those with Edward Charles Williams, where Williams would paint the landscape and Shayer would add people and animals. Shayer’s eldest son, William Joseph Shayer (1811-1892), was also an artist and painted in a similar style to his father, so their works are often confused. What makes it even more confusing is that the two probably worked together on several paintings in Shayer senior's later life. Three other sons, Edward Dasherwood Shayer (1821-1864), Henry Thring Shayer (1825-1894) and Charles Walker Shayer (1826-1914) also became painters, and all, at times, assisted him in his studio. William Shayer died in 1879, aged 92, at his home, Bladon Lodge. He was a very popular artist and his work has a depth and brightness due to his skilful application of glaze where he spread a thin, oily, transparent layer of paint over a dry opaque paint. He had 6 works exhibited at The Royal Academy, 82 works at The British Institution and a remarkable 338 works at The Suffolk Street Gallery of the Society of British Artists. The painting is in need of restoration but one can still see the artist’s skill in this peaceful rural scene. 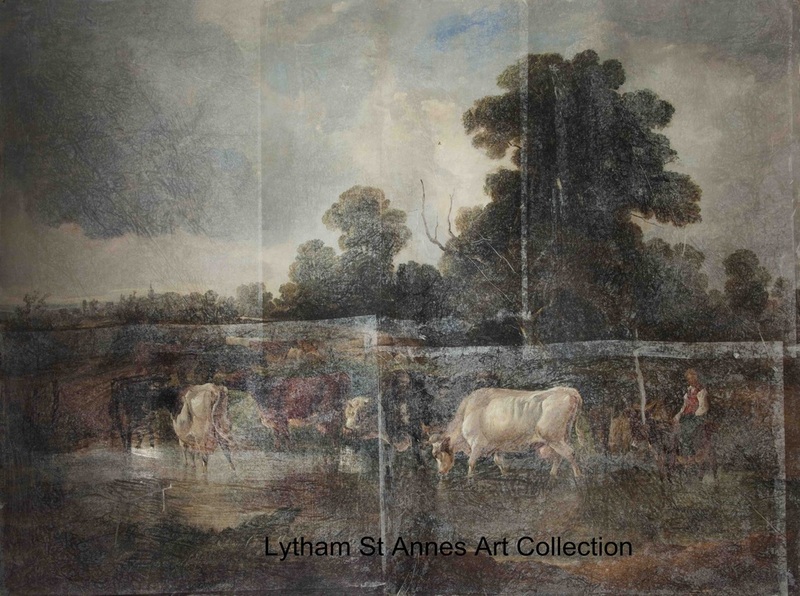 The cattle in the stream are finely depicted and are grouped and painted in colours which draw the eye to the middle ground. They are watched over by a lone figure on a horse or donkey to the right of the picture. The sky illuminates the scene below and its cool colours contrast with the stronger colours and textures of the trees and vegetation. It is a harmonious composition of depth and space. Henry Randle Heys, the donor of the painting, was born in 1916 in Ramsbottom, Lancashire, to Henry Howarth Heys (1880 -1937) and Eveline Ellen, nee Armstrong (1879-1939). The 1911 census describes Henry Howarth Heys as 'a cloth buyer'. He was a captain in the 5th Battalion of the East Lancahire Regiment in WW1. He died in Lytham in 1937, having lived at Westfield, Clifton Drive from at least 1929. His father, William Randle Heys (1846-1883), was also a yarn merchant of Ramsbottom and was a stalwart of the community. In St Paul’s Church, Ramsbottom, there is a window dedicated to William’s memory entitled 'Christ Walking on the Sea'. Henry Randle Heys served in WW2. It was through his generosity that a communion rail was installed in St Paul’s to mark the long association of his family with the church.